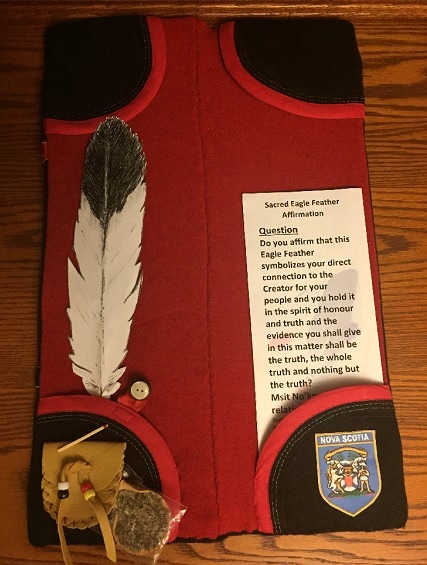 Indigenous witnesses, accused individuals, victims and others appearing in the Nova Scotia Courts now have the option to take legal affirmations with a sacred eagle feather. Each main courthouse in the province will have one eagle feather for courtroom use and a second for the front counter. The feather will be available in courtrooms for taking an affirmation in the same way that a Bible is available to swear an oath. Those testifying may hold the eagle feather, or have it placed in front of them, while affirming to tell the truth. Individuals are also permitted to bring their own eagle feathers with them to court. In First Nations culture, the eagle is considered sacred because it flies the highest and closest to the Creator. Its feathers are a symbol of spirituality that are used in many Indigenous traditions. Nova Scotia RCMP were the first in Canada to make eagle feathers available for victims, witnesses, police officers and others to swear legal oaths and to provide comfort for clients interacting with RCMP officers. The initiative was expanded to the Nova Scotia Courts at a ceremony on Nov. 8, 2018. Indigenous witnesses, accused individuals, victims and others appearing in the Nova Scotia Courts now have the option to take legal affirmations with a sacred eagle feather. Elder Jane Abram blessed 33 feathers at the ceremony in Halifax. Each main courthouse in the province will now have one eagle feather for courtroom use and a second for the front counter. The feather will be available for taking an affirmation in the same way that a Bible is available to swear an oath. Those testifying may hold the eagle feather, or have it placed in front of them, while affirming to tell the truth. Individuals are also permitted to bring their own eagle feathers with them to court. Chief Paul J. Prosper, Justice Lead for the Assembly of Nova Scotia Mi’kmaq Chiefs, spoke with the judges about the symbolism of the eagle feather, as well as the history and significance of the Honour Song, smudging and the role of Elders in the Indigenous community. The Nova Scotia Judiciary took another important step toward reconciliation in June 2018 when it celebrated the grand opening of the new courthouse in Wagmatcook First Nation. The Court in Wagmatcook is among the few in the country that holds regular sittings on reserve and fully incorporates Indigenous restorative justice traditions and customs, including the eagle feather. Nova Scotia also operates a satellite court out of Eskasoni First Nation.